I write a few lines hoping they will find you, your dear wife & family all in good health; also knowing you are fond of family relics & curiosities, I wish to say I have a posset pot, will hold about 2 qts cups, with 2 handles with my grand-parents names upon it, Joshua and Mary Hall 1781. It is blue & white, a curious pattern, the name is on the side and underneath. I had it from Aunt Walker, she would have had it from her parents, they would have it sent from Mr Lackets manufactory of Burslem, a relative. I remember him also visiting at his house with father & mother, a rich old Gent, but his property got dispersed other ways, not thought right, at that time. He also sent mother some china. I have the sugar pot with handles, the only thing left of the whole lot, in china pattern. The person, who gave them the Indian priest, you have, neither of them broken or cracked. I thought you would like to have them being the only one in the family to continue the name. I also have a curious ancient piece of embroidery, that my dear mother gave me, would do for the museum – now what can or would you give for them. I would with great pleasure give them to you, they are doing me no good, but my expenses are more here than they were in Huddersfield, and my income very small as you know, but I beg to make myself as comfortable as I can, surrounded with kind neighbours and friends, and I have the greatest respect, by all the best families. Mr Baker the Minister at church often calls to see me. I am alone, quiet, and happy, hoping you all may have a pleasant Xmas and a happy new year. I shall be glad to hear from you when at leisure after considering the matter over. Aunt Woodhouse was Mary Anne Hall (1805 - 1892) who married Joseph Woodhouse and had two children, George and Martha. William who the letter was written to, was William Hall the surgeon who married Louisa Platt. Aunt Walker was Elizabeth Hall (1879 - 1851) who married Benjamin Walker. 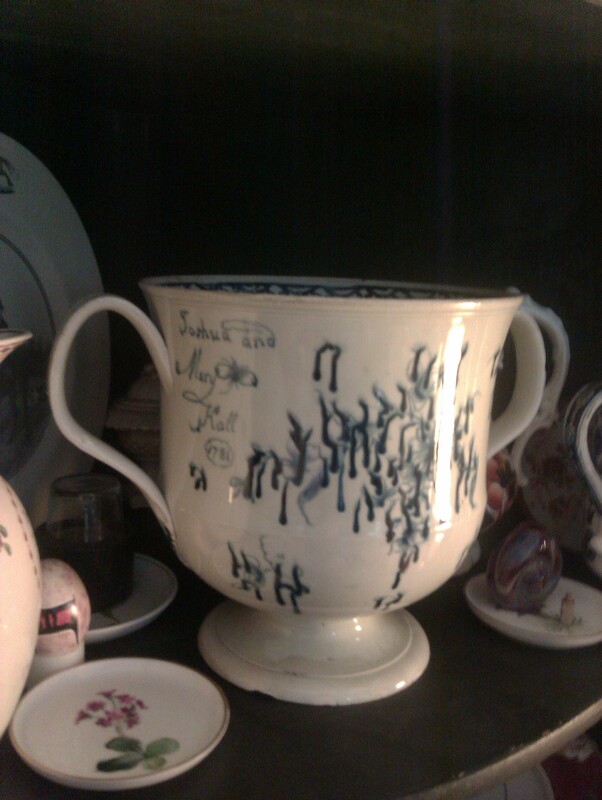 Her parents were Joshua Hall and Mary (nee Ramsden) who the posset pot was made for. A posset pot was a traditional gift used for containing posset, which according to Wikipedia, was a soothing and medicinal drink used for treating colds and consisted of boiled milk, eggs and spiced wine. There is a posset pot on display in the Victoria & Albert museum. Burslem where the posset pot came from was a village now forming part of Stoke on Trent. Mr Lacket whose factory made the posset pot in Burslem is described as a relative, but I am not sure how he is related.